This is my favorite appliqué construction method. 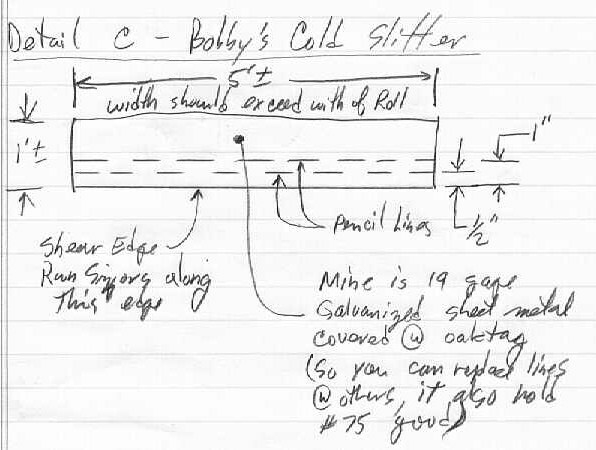 It combines Bobby’s sandwich & bind method with my modification of cutting directly on the pattern, which saves reposition time, reduces the number of patterns required, provides a clearer picture of what’s going on, and significantly increases life of utility knife blades. There are 4 separate steps required for each sail section. Create the patterns on oaktag (cat# OAK-48 = 48” wide oaktag by forever long from Kite Studio). Note it is possible to splice an extra piece of oaktag on to another piece, just use masking tape on both sides of the splice. I know that’s pretty basic but it’s so obvious that it’s usually overlooked. The piece of oaktag used for a particular pattern should be oversize by a minimum of 4” around the outside of the final size of the sail. The extra oaktag keeps the whole thing from falling apart during the cut stage in steps 3 & 4; and, its a nice place to make pertinent notes regarding this kite as you think of them throughout construction for when you want to make kite #2 from this pattern; or, for when you create instructions for submission to Kitebuilder.com to publish your creation. 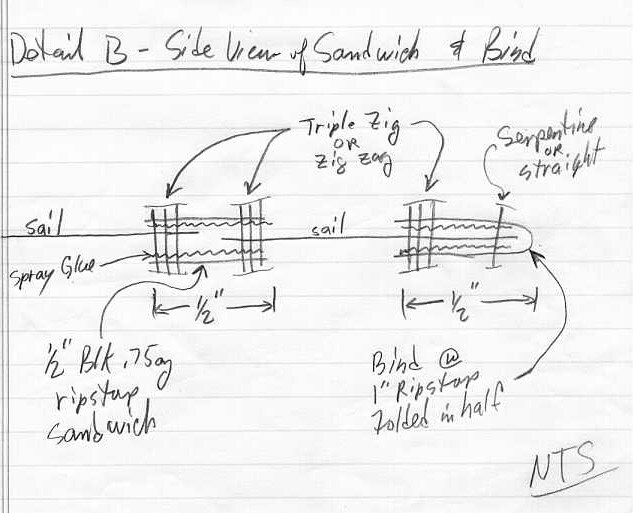 The width of strips used for sandwiches and binds are a matter of personal preference. Bobby likes a 3/8” wide sandwich and a, 3/4” plus a little, bind folded in half, on the edges. 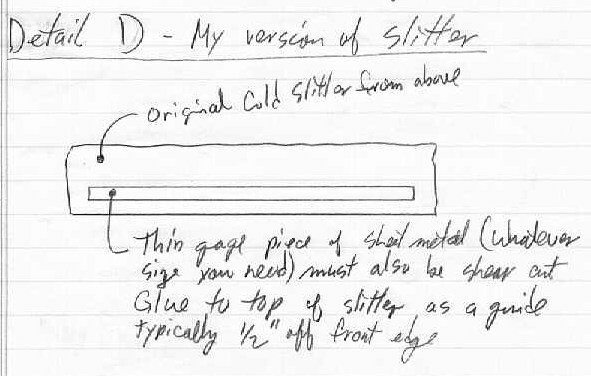 He also COLD cuts all his black strips using a metal cold slitter (Detail C) made from ideally a 5’ by 1’ piece of thin galvanized sheet metal (mine is 19 gage) with one long end “shear cut” by a machine, at your local HVAC shop, to insure perfect straightness along that edge. Then you glue using repositionable spray [Bobby likes 3M red spray mount for everything, I like 3M #75 (GLU10)on glass and oaktag and Design Master 1000 (GLU20) for fabric] a piece of oaktag on top of the sheet metal so you can very accurately place some guide lines of various widths with pencil on the oaktag. Note the oaktag is required so as to be replaceable and to allow you to change line widths as required. Then you spray the oaktag with #75 and let it dry. Now you can place a width of rip stop on the slitter (obviously the first cut is just to make a straight edge to start), and while the slitter slightly overhangs the edge of the table, run a very sharp scissors along the shear edge to COLD CUT strips 3/8” or 3/4” plus pieces. Once set up this is a very fast method. I, on the other hand, am lazy, so I choose to use the pre-slit to 1” black ripstop off the kid’s shelf (Kite Studio cat#FSR7510) instead of the 3/4” plus; and, I cut the 1” stuff in half with a special piece added to my cold slitter, a permanent 1/2” stop, (Detail D) to make 1/2” stuff for the sandwiches. This is infinitely easier and it creates a wider seam & bind that I think looks better on the Big kites I make. Lastly the strips are put on a vertical tack board (which is another sheet of oaktag lightly sprayed with #75 pinned up on a wall, this is for overspray protection). Yes, this system uses a lot of oaktag and spray glue, but the Kite Studio has to make some money somehow. The strips are stuck up vertically and then sprayed with DM1000 and let to DRY. This is very important. Glue must not be wet to the touch, and if it comes off on your finger its too wet. Because, if its wet its not repositionable. So Let It DRY a few minutes before using it in steps 3 or 4. There is an other method of creating strips without a slitter... This is also a very slick method and I always use it when I need strips that are colors other than black. Unroll ripstop on glass & using a 5’ Tony Stick-aluminum sticks of various sizes available at Kite Studio. Cat#RAL10, if you want it fancy or Cat#SALB1310 through SALB2575 if you want aluminum stock. You'll need to file and sand the edges yourself. Then hot cut on both sides of the aluminum stick of appropriate size to create whatever size strips you want. Note: It helps if the glass table has a very lite coat of #75 just to hold everything in place during this operation. Finally, as with the cold slitter, place the strips on the vertical tack board and spray with DM1000. Let DRY before using. Now, using a Tony Stick and a utility knife with a sharp new blade make the final cut for the sandwich seam. Press lightly on the knife so as to go thru the 2 layers of ripstop, but not go thru the oaktag. This sounds hard, but it’s really easy when you get the hang of it, and the blades last a lot longer then cutting directly on glass. (Note: free hand curved cut parts, but that’s advanced class). Now peel back the 2 finished pieces and discard the falloff. Weights are handy to hold the peel back in position away from the proposed sandwich area. Take a 1/2” strip sprayed with DM1000 created in step 2 and lay it down, glue side up (Detail B). Remove the weights and smooth out the 2 colors. You should now have the cut part of the colors centered on top of the 1/2” strip. That was the hard part. 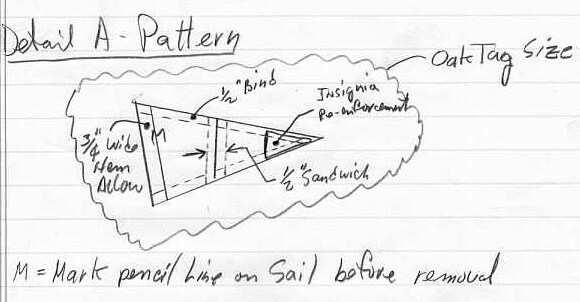 Return sail with completed sandwich and reposition on pattern. Using straight edge and knife, cut the ripstop around the edges to finished size and discard falloff. Make a small pattern the exact size of the insignia re-enforcement for the sail tip. Then put 2 pieces of insig good to good and using the pattern cut out simultaneously a pair of tip re-enforcements. Cutting pairs insures that the visible portion of the insignia is perfectly aligned. this part is for the judges. Remove backing and stick insignia to top of sail. Peel sail back and stick the 2nd piece of insignia to the back of sail, carefully aligning the exposed edge as seen thru the ripstop. As in step 3, hold sail back off 1st bind edge with weight. (Detail B). Lay down 1” strip black ripstop on pattern, glue side up, remove weight, straighten out the sail, lift up the 1” and fold it to 1/2”. Once again, this is really hard to explain, but really easy to do, after you have done it a couple of times. Do some samples top get the hang of it. Do the same thing again with bind #2. Now Very Important, before you remove the sail from the pattern. Make all pencil marks on the sail that are required to sew 2 or more pieces of sail together later on in the project, also mark code numbers to identify this piece if it’s a complicated project. Then, carefully remove sail from the pattern, take to sew machine and zig or triple zig it along the inside edge of the bind. A second sew around the outside of sail is recommended. I use a serpentine. Use whatever stitches you think look best. This sail part is now complete. Repeat steps 1 to 4 with all remaining sail parts for this project. What I have just said in steps 3 & 4 work really good when the color of the ripstop used is a lite color; because you can easily see thru the ripstop to align the sandwich and the bind. When, however, the color of the ripstop is dark or at it’s worst, black, it becomes much more difficult since you can not see thru the ripstop. My solution to this problem is this. First you need to be working on a glass light table with the table lights on; then turn off the lights in the room. It also needs to be night time if there are windows in the room. I know now I’m getting fussy. Amazingly, pencil lines are now visible thru the ripstop even when it’s black. In addition this presentation assumes you have done this all in one day, one step right after the other. I should point out that letting any spray glue dry to long, causes it to become so dry that it will not stick. No problem, just reapply another lite coat of spray, wait a minute, and you are back in business.